$2.25 Lyft Line Rides. That’s Right. Whether you’re a weekend or a weekday warrior, get ready to celebrate. Starting today, Lyft Line rides in San Francisco are only $2.25. Use the code MATCHMUNI to unlock $2.25 Lyft Line rides anywhere in the Drive Happy District (map below). Step one? 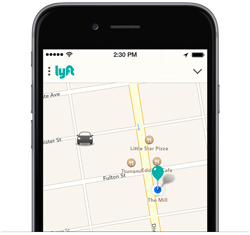 Download the Lyft app for iPhone or Android. 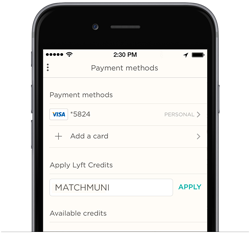 Then, open the Lyft app and enter the code in the ‘Payment’ section. But move fast. This won’t last long! Rides must start and end within the zone to be $2.25. Boundaries are east of Stanyan St. and north of Cesar Chavez St. Enter your code in the ‘Payment’ section. Be sure to hit 'Apply'! Select Line in the top-center ride selector. Then, request a ride. We’ll text you when your Line arrives. Just hop in! Don’t let your friends miss out. Share the code MATCHMUNI before time runs out! P.S. That isn't to say we don't love our friends at MUNI! MUNI and Lyft Line go hand-in-hand. This limited promotion makes it even easier for you to get to where you need to go. P.P.S. If you don’t have Lyft yet, what are you waiting for? Download now for iPhone or Android.